The client is an owner of multiple beauty salons in USA. He wanted us to design and create a native iOS app. This app would act as a platform for users to locate the nearest beauty salons and book an appointment. Also, he wanted us to create the admin web backend that would help salon owners to add various salon details and manage bookings. 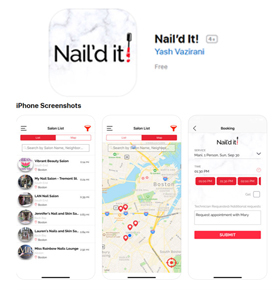 We created an attractive and user-friendly design for the native iOS app “Nail’d it”. Apple certified iOS app developers at SynapseCo analyzed the specific requirements of the client and created the app having various features like “Search Salon”, “Salon List”, “User Account page”, “Salon Details”, “Loyalty Rewards”, “Booking”, etc. Moreover, we created the admin backend to add/edit/manage various salon details. Using the web backend, the super admin can add and manage sub admins. The backend also helps them to check and manage appointments booked through the app.